When reforms against repression begin, repression becomes less tolerable: so goes the Machiavellian proposition. (1) Nowhere does this maxim hold more true than in Kosovo. From 1971 to 1981, Albanians in Kosovo progressively gained rights and, in the process, experienced unparalleled progress in the fields of education, science and culture. With the opening of the University of Pristina in 1969, Kosovars had access to Albanian-language instruction in primary, secondary and university classes;(2) institutes for Albanian literature and culture were opened; and cultural ties between Albania and Kosovo were permitted, leading to an influx of books from Albania to Kosovo, the exchange of visiting professors and even the planning of joint film productions. (3) Although not perfect, the national "key" system--akin to proportional affirmative action--assured Albanian representation on managerial boards of state enterprises, in civil service and in provincial and federal government. During 1978-79, the vice-president of the federal Presidency (which after the death of Tito became a collective body) was a Kosovo Albanian, Fadil Hoxha, making him the highest-ranking Kosovo Albanian ever in Yugoslavia. Within the framework of Yugoslavia, then, Kosovo Albanians had never achieved so much in such a short time. The staging of Albanian demonstrations at this time period confounded Serbs. After all, things seemed to be going so well. "Minority rights of Albanians in Kosovo until 1989 were guaranteed beyond and in excess of international standards," legal scholar Vladan Vasilijevic notes. (6) The sentiment among Serbs was along the lines of: "We had given them everything, even their own university, their own government. "(7) But Albanians did not want to be in the position of being given anything. Despite the reforms, notes Sami Repishti, a U.S.-based academic originally from Kosovo, "the feeling of dependency on Serbia . . . remained a major source of friction and deep dissatisfaction. "(8) Moreover, Kosovo Albanians felt a personal affront at not being considered a "nation" but only a "nationality," a lower status under the nomenclature of Yugoslavia. The insult of Yugoslavia not considering Albanians a "nation" could not be compensated with a university, nor with a provincial government. As a mere "nationality," Kosovo Albanians did not have the right to their own republic. The heart of the political tensions in Kosovo rested in this denial of republic status. (11) Nevertheless, constitutional changes introduced in 1969, 1971 and 1974 gave Kosovo greater autonomy and the ability to forge direct links with federal authorities. (12) Under the 1974 Constitution for the Federal Republic of Yugoslavia, Kosovo was considered an "autonomous province" of Serbia. (13) This made Kosovo a "quasi-republic," with a government, constitution, police, courts, school system, industry and economic institutions--almost everything except the right to secede from the federation, a right that the full-status republics possessed. As Albanian political leader Azem Vllasi has observed, "Kosovo functioned as a republic in the federal state of Yugoslavia and we were not [a republic] only by name. "(14) But for Kosovo Albanians, almost was not good enough. The rights of the territorial unit known as "the Autonomous Province of Kosovo" were still at least formally tied to the Constitution of the Republic of Serbia. (15) Shedding every trace of dependence on Serbia became Kosovo Albanians' primary goal. >From 1971 to 1981, public expression of political dissent was suppressed in all parts of Yugoslavia,(21) but the greatest percentage of political prisoners were Kosovo Albanians. (22) The decade began with a stiff warning to those with national or "reformist" sentiments: the silencing of dissent in Croatia in 1971, when Tito removed the reformist leadership of the League of Communists. (23) Taboo subjects included nationalism (and any criticism of the unity of different ethnic groups), criticism of the structure of government of Yugoslavia, including the operations of the League of Communists and its leadership, and any challenges to basic domestic or foreign policies. (24) Although some national cultural events were tolerated, such as the League of Prizren events, the authorities maintained discretion to control and prosecute anything deemed to be organized national activity and, in particular, any acts considered separatist. The rising expectations of Kosovo Albanians concerning the strengthening of their national rights were both helped and hindered by publicity surrounding state retaliation against Albanian political expression. Any Kosovo Albanian who voiced any political opinion whatsoever risked being branded as an "irredentist," a person who sought to unite all the members of his or her ethno-national group in an autonomous state. Arrests of Kosovo Albanians served to create martyrs for the Albanian community. Many of those fined or arrested were not in fact irredentists but rather small time graffiti writers or fourth-hand readers of underground publications who happened to get caught. (31) Nevertheless, these unlucky ones took their place among real and imagined Kosovo Albanian leaders as the emerging heroes. Meanwhile, conditions in other federal units improved, widening the development gap between Kosovo and all other republics. The per capita income in Kosovo declined from 48 percent of the Yugoslav average in 1954, to 33 percent in 1975, to 27 percent by 1980. (43) According to calculations by Serbian economists, Albanians continued to earn less than members of other ethnic or national groups; moreover, Albanians earned far less in Kosovo and in Serbia proper than in any other part of Yugoslavia (see table 1.2). The discrepancies between more and less developed regions in Yugoslavia can be seen in a comparison of basic indicators for regional development, as measured by GMP (Gross Material Product), GMP per capita and average growth of GMP. Kosovo lagged behind the country average in all of these measures. (See table 1.3.) In addition, although Kosovo and the other less developed areas significantly increased their fixed assets per worker, the return on the investment was low. In her analysis of data from this period, Vesna Bojicic has found that although the investment ratio was higher in Kosovo than the Yugoslav average, "in order for less developed parts of the country to achieve the same economic performance as more developed republics, the investment input had to be significantly higher." Once the data on population growth is added to the equation, "a vicious circle of poverty emerges, with per capita income in poorer areas growing only slowly, from a low base. "(46) Some analysts point to the uneven regional development in Yugoslavia as a critical factor in the country's disintegration. (47) With respect to Kosovo, these disparities constituted one of several factors fanning national tensions. The problem was compounded by the chosen courses of study at the university. Instead of training students for technical careers in a modern age, the university specialized in liberal arts, in particular in Albanian literature and culture. (60) Competition for the few jobs that existed in this field was fierce. Also, lacking a sufficient supply and breadth of Albanian-language textbooks in these subjects, the high schools and universities imported texts from Albania. Given Albania's different ideological bent, these texts necessarily included ideological and philosophical undercurrents contrary to those produced in Yugoslavia. Tito had originally envisioned the cultural exchange between Kosovo and Albania as a bridge along which Yugoslavia would be able to exert influence over Albania. For the most part, however, there was only one-way traffic from Albania to Kosovo, and the young Kosovar students were "like a very parched sponge, immediately avid to absorb anything that helped to illuminate their past history and made sense of their contemporary situation. "(61) Those who were university students in 1981 contend that they looked beyond the ideological leanings of the books to the cultural content. (62) Nonetheless, the books, the students and the educational system would later be blamed for the growing discontent at the University of Pristina. After two weeks of calm, the protests resumed in Prizren (southern Kosovo) on March 25, and again in Pristina on March 26, when Albanian students occupied a dormitory. This time, the demonstrations grew violent. The Pristina daily Rilindja reported that thirty-five people were wounded and twenty-one students arrested in this second wave of protests. Despite intense police pressure and numerous arrests, the protestors would not leave the streets. The second week in May, thousands of students and supporters once again occupied the dormitories at the University of Pristina, and police once again used tear gas and clubs to disperse the crowd. (81) Elementary and public schools, which had been closed during the first wave of unrest and reopened two weeks later, were declared closed for the summer. The events in Kosovo had a tremendous impact on Albanians living in other parts of Yugoslavia. Demonstrations broke out in Tetovo, in northwestern Macedonia. Protestors there called for the establishment of an Albanian-language university and, alternatively, for the inclusion of "Albanian parts" of Macedonia into Kosovo. (82) A number of "incidents" were also reported in Montenegro, from graffiti writing to the formation of unauthorized, purportedly separatist organizations. Similar unrest was reported in towns in southern Serbia and Zagreb. Who were the domestic and foreign enemies? Conspiracy theories abounded, and in the new post-Tito era the press and the public were more free to explore them. Conspiracy theories fall on particularly fertile ground in the Balkans. Mihailo Crnobrnja has noted the intransigence of such theories in post-Tito Yugoslavia: "Though such a theory can be challenged, it is extremely difficult to refute partial and individual statements by its adherents. When faced with an individual statement by a conspiracy-theory zealot, a rational person runs the risk of appearing naive or uninformed, especially if the conspiracy theory comes from such authoritative sources as academies of science, the leadership of political parties, or individual political leaders who have a considerable following. "(87) For these reasons, history as myth in the Balkans--as opposed to history as fact--is often colored by theories of conspiracies. The theories about the 1981 demonstrations all sounded at least a little possible, especially when presented in a piecemeal fashion and when delivered to audiences looking for anything that could help them make sense of their lives. Julie Mertus provides one of the first comprehensive looks at the explosive situation in Kosovo, where years of simmering tensions between Serbs and Albanians erupted in armed conflict in 1998. In a profound and detailed study of national identity and ethnic conflict, Mertus demonstrates how myths and truths can start a war. She shows how our identity as individuals and as members of groups is defined through the telling and remembering of stories. Real or imagined, these stories shape our understanding of ourselves as heroes, martyrs, conquerors, or victims. Once we see ourselves as victims, Mertus claims, we feel morally justified to become perpetrators. Based on a series of interviews conducted in Kosovo, Serbia proper, and Macedonia, this book is one of the first extended treatments of the years leading to war in Kosovo. Mertus examines the formation of Serbian national identity, and closely scrutinizes the hostilities of the region. She shows how myth and experience inform the political ideologies of Kosovo, and explores how these competing beliefs are created and perpetuated. This sobering overview of the region provides a window into a complex struggle whose repercussions reach far into the international community. 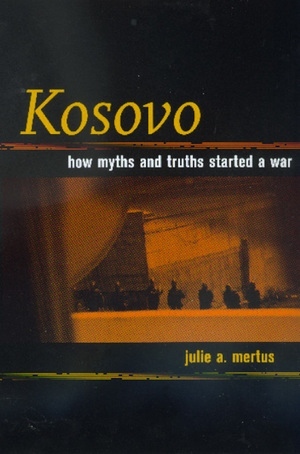 Julie A. Mertus is Professor of Peace and Conflict Studies at American University. She is the coeditor of The Suitcase: Refugees' Voices from Bosnia and Croatia (California, 1997), coauthor of Open Wounds: Human Rights Abuses in Kosovo (1994), and the author of Local Action/Global Change (1999). Mertus's articles on the Kosovo crisis have appeared in major newspapers. 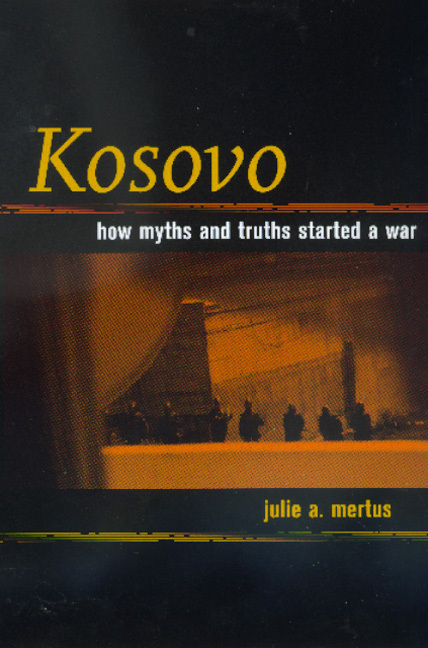 Preface: Understanding Kosovo Through "Truths"